(NaturalNews) California will be the origin of America's first wave of medical police state refugees fleeing medical tyranny if Gov. Jerry Brown signs SB 277 into law. SB 277 is California's pharma-funded vaccine assault on all parents and children. It would eliminate all personal belief exemptions and force nearly all children in California to be forcibly injected with vaccines that are knowingly manufactured with neurotoxic substances such as mercury, aluminum, formaldehyde and MSG. If he signs the law, Gov. Brown will be declaring medical genocide against children whose genetic makeup causes them to have extremely heightened risks to vaccine injury. No child will be safe in California, and the state will cement its position as the first real-life medical police state in America, where risks of a medical civil war skyrocket. Natural News has heard from dozens of readers who tell us they are making preparations to flee the state if SB 277 is signed into law. Mandatory vaccines at gunpoint are "the last straw," according to one mom who wrote Natural News about her concerns. "All these state senators voting for the bill received campaign donations from the drug companies. They sold us out to the corporate interests. There's nothing else we can do but leave..."
Other parents are looking at pulling their children out of public schools (government-run indoctrination centers) and home schooling them instead. This effort, of course, has enormous economic consequences for a family, so not all parents can structure their child's education around home schooling. California has historically been home to parents who sought a green-living, natural lifestyle that was relatively free from toxic chemicals. 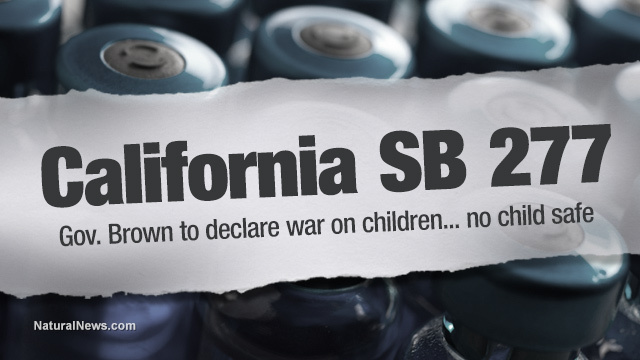 If SB 277 is signed into law, the California government would force potentially deadly chemicals onto all the children across the state, betraying the core principles of medical choice, medical ethics and compassion for children. Green living, in other words, would be replaced by medical tyranny. And if the state decides it can force one medical intervention on parents and their children, then it will of course ratchet that up to any number of dangerous medical interventions it wants to force upon the population. Remember: a state that doesn't respect a woman's choice about medical interventions is a medical police state. Vaccines provably cause brain damage and death in many children. Just recently, the UK government agreed to pay out $90 million in financial compensation to families of children who were brain damaged by the swine flu vaccine. Similarly, the secretive U.S. Vaccine Injury Compensation Program has paid out nearly $3 billion in compensation for children who were provably harmed or killed by vaccine injury side effects in the United States. The CDC scientist Dr. William Thompson went public in 2014 with proof that the CDC committed scientific fraud to cover up links between vaccines and autism in African-American children. The entire lamestream media blackballed the story in a massive, coordinated conspiracy to silence the truth and promote the financial interests of their corporate sponsors. It has since been learned that the CDC is not a branch of the federal government but a private corporation operating in total violation of U.S. law. The CDC even trains and deploys intelligence operatives like Nurse Hickox to spread false propaganda about infectious disease. Many intelligent observers now believe the CDC is the key architect behind a nationwide push for an epidemic-driven medical police state. "Epidemics" are the perfect Orwellian enemy that never goes away, and as long as the CDC can fake the hysteria surrounding epidemics -- its claim that the flu kills 35,000 people a year is pure fiction -- it can seize control of the country's public health domain. The CDC's pushing of false disease hysteria goes all the way back to the discovery of AIDS, after which the CDC went berserk, claiming that even straight married men were going to be overrun by the epidemic. Congress responded with billions in new funding, and the CDC learned an important lesson: the more hysteria it can create around infectious disease, the more powerful it becomes. The contrived Disneyland measles outbreak was another example of how the CDC masterminded mass hysteria to push a medical police state agenda. In reality, the measles "outbreak" was extremely small and no one died. Yet the CDC uses the hysteria to push for mandatory vaccines that will kill, maim or injure thousands of children each year in California alone. The "treatment" is worse than the disease! But the hysteria and fear mongering are necessary to maintain total dictatorial control in the medical police state. What we really have in America today is what journalist Jon Rappoport called "Totalitarian science." This is government-run pseudoscience enforced at gunpoint. 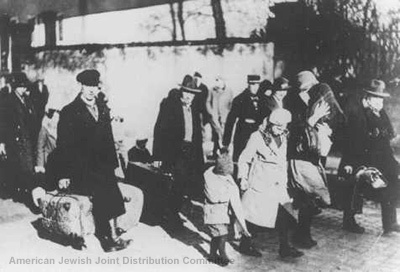 Alongside the government gunpoint enforcement, you also have total censorship of all scientific questions about vaccines, total media censorship of any dialog or discussion about vaccine injury, and really what can only be called "runaway vaccine injury denialism" among the entire medical establishment, whose harmful actions against children really do parallel the Nazi Holocaust in terms of its pharma origins and utter abandonment of medical ethics. California Gov. Jerry Brown, an unapologetic Big Government statist, is playing right into the hands of the CDC and the medical police state with SB 277. If he signs it into law, he will be reinforcing the effectiveness of staged "pandemic paranoia" schemes while enslaving tens of millions of people in a medical police state structure from which the CDC and the vaccine industry can demand UNLIMITED vaccinations at any time, for any contrived reason. Even more shockingly, such vaccinations can be demanded and required no matter what toxic chemicals the vaccines contain. There is no exemption against vaccines made with mercury, for example. There's no exemption against vaccines formulated with formaldehyde, another potent neurotoxin. SB 277 would make California the first state in America which forces its own people to be neurologically poisoned with medical injections. That's probably why so many people who wish to protect their own neurological function are deciding to flee the state. It's the simple principle of "cognitive self-defense." If you want to have a healthy brain, you have to leave California entirely. The hilarious upshot of all this, of course, is that the only people left behind will be those with damaged brains who continue to vote for more corrupt bureaucrats to keep poisoning them. Welcome to Collapsifornia, where the inmates are truly running the asylum.